There are few things in life more beautiful or more satisfying than seeing the sun set while sailing effortlessly by the power of the wind. At Waterford Harbour Sailing club we have a very successful mix of racing yachts and a wide variety of distance and day cruisers. 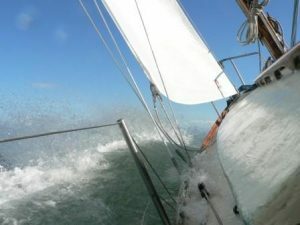 While dinghy racing generally requires more physical effort and involves occasionally getting wet or even swimming, cruiser sailing relies on the keel to the do the work leaving you to enjoy the scenery or concentrate on the tactics of racing in a group setting. Whether you would like to tour the estuary aboard a comfortable sailing boat or race intensively against other finely tunes racing yachts we have everything you could want, all you need bring is your enthusiasm. There are generally yacht races on Thursday evenings and Sunday afternoons between May and September see cruiser racing for more information. If your preference is to dip your toes first into what happens aboard a yacht with some expert instruction and guidance then perhaps an introductory afternoon with Gary Curran is for you, see cruiser sailing courses and if you feel you are ready to experience racing then just contact any of the boat owners, club members or cruiser class captain and we will get you a place with the nicest crew we can find. 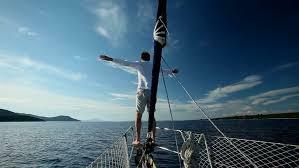 Sailing is as easy or as difficult as you want it to be, it is all things to all people offering a serene relaxing way to watch the world go by for some, offers a physical and tactical challenge to others and becomes a way of life for many. If you’re interested in crewing on a boat you are most welcome at WHSC. You can contact the cruiser captain Dave Marchant 087-253 7092 and he will bring you in touch with one of the skippers. Alternatively come on Thursdays at 18.30 or Sunday afternoons at 14.15 to the slip and ask for the Cruiser captain..